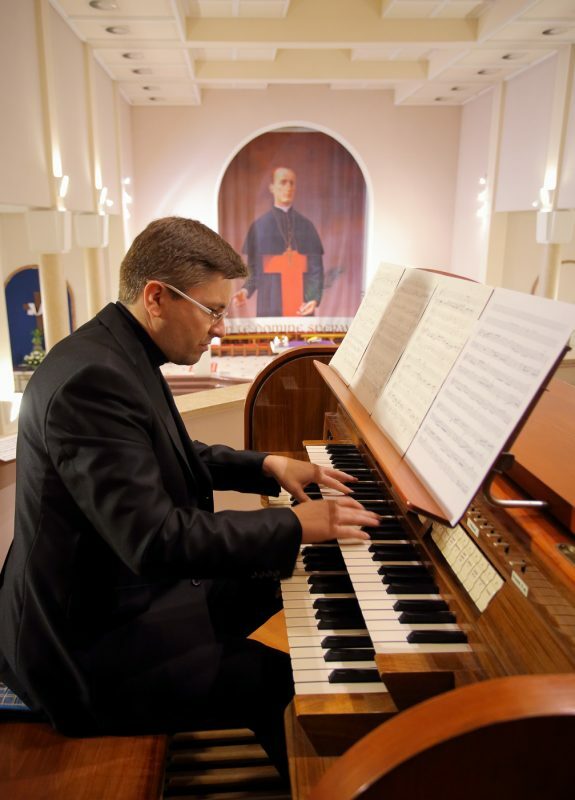 It was a great pleasure hosting Višeslav Jaklin, a Varaždin cathedral organist, one of the most prominent Croatian artists of the younger generation to the 5th season of the classical music cycle “Po svetonedeljskim crkvama i kapelicama”, as a guest of “Projekt Lazarus” ensemble. Jaklin chose an occasional and yet demanding solo organ program that began with Pastorale in F major of J. S. Bach, immediately “capturing” the listeners with the most interesting use (in each of the first two sections) of “Piffero” or “piping” style, based on the drone bass line and skirling bagpipe melodies widely encountered in Italian Christmas folk music. Even in the late twentieth century, the ancient traditions of bagpipe-playing shepherds processing through small towns have been upheld at Christmas, the idea being that the ritual recalls the shepherds’ journey to Bethlehem. In the well-known Lutherian coral “Nun komm der Heiden Heiland” showed Jaklin his great talent by revealing complexity of this coral in a sovereign manner, in which the filigree melody of the cantus firmus was superbly put together with two accompanying lower register manuals. The “7 works in the D major and d minor for Christmas time” by French composer C. Franck brought to the light a collage of moods in which Jaklin, delicately using organ registration, achieved the effect of a great orchestra and brought out a true Advent ambiance that stirred the gathered audience. His performance ended with his own improvisation on the theme of the 17thcentury hymn “Wer nur den lieben Gott lässt walten”, presenting himself to the audience as a powerful and creative improviser. The “Projekt Lazarus” ensemble presented motets for two and four voices of Lukačić and Jelić, two of the most important Croatian early baroque composers, from the collections of “Sacrae cantiones” (1620) and “Parnassia militia” (1622). Along with the sovereign and engaged accompaniment of the artistic leader Darijan Ivezić, the vocal artists of the “Projekt Lazarus”; Daniela Perosa, soprano, Nikolina Virgej Pintar, mezzosoprano, Siniša Galović, tenor and Robert Palić, bass, with a suggestive and subtle performance, introduced the audience into a contemplative Advent atmosphere. Parish of Bl. Alojzije Stepinac / Bestovje-Novaki-Rakitje /. The Tourist Board of the City of Sveta Nedelja.